Several years ago I worked with a person who was invited to lead a traditional organisation. His brief was to shift the culture and make it fit for purpose. “We have put together a plan for your first two months. Here is a schedule of all the committees you need to attend. The person attended some functions, but then created a different schedule. Within six months he had delivered a superb campaign that won national recognition for the organisation. The success was not appreciated, however, because he had failed to use the organisation’s traditional channels. He left to do imaginative work that has been lauded across the world. 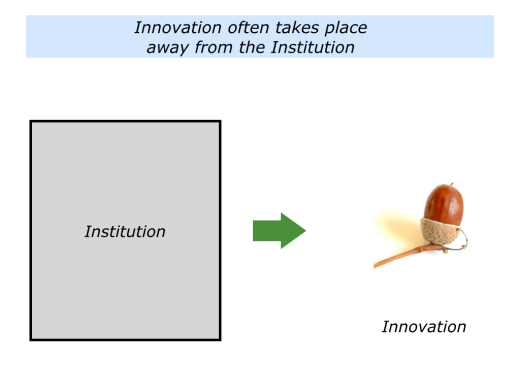 Many innovators choose to spend time away from institutions. 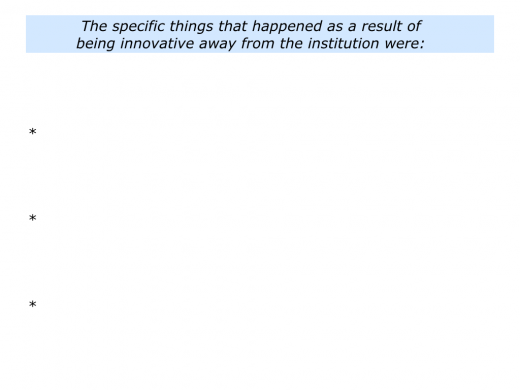 The institution may be a building, organisation or other body that has an ambivalent attitude towards creative thinking. Some innovators may still belong to an organisation, but they create some kind of distance. This may be a physical distance, such as working at home or in their own laboratory. Or it may be a psychological distance, such as doing things differently. 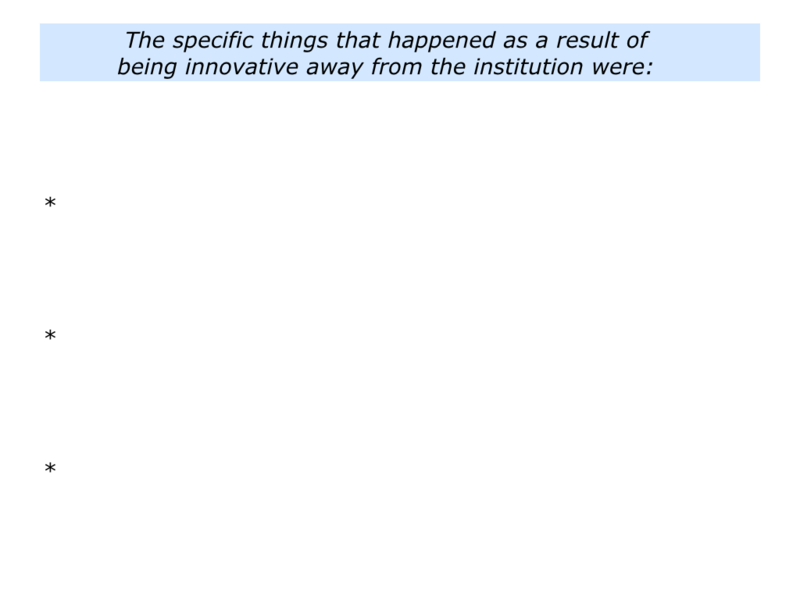 Looking back on your own life, when have you managed to be innovative away from some kind of institution? What did you do to set aside the time and space to think and create? Different people do this in different ways. They may work as a freelancer, take a gap year, embark on a study tour, have their own personal side project, work at home one day a week or whatever. 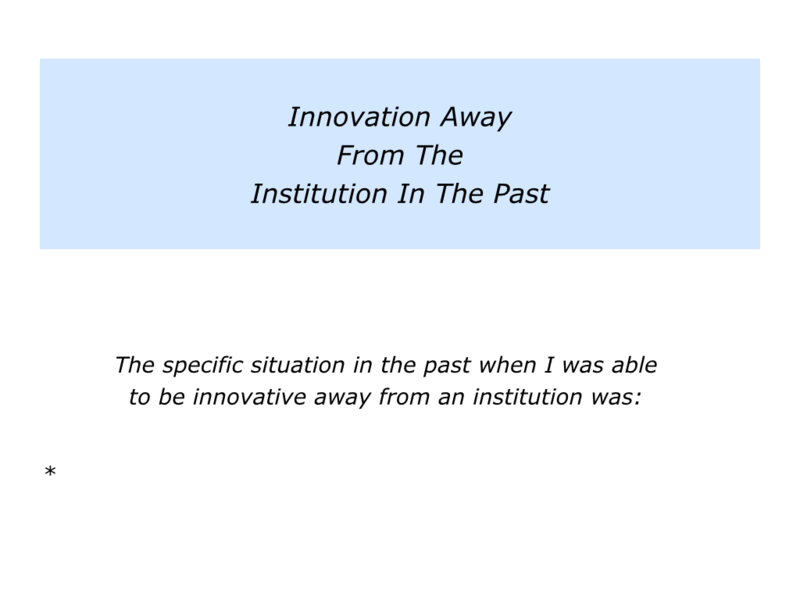 Describe a specific situation in the past when you were able to be innovative away from an institution. 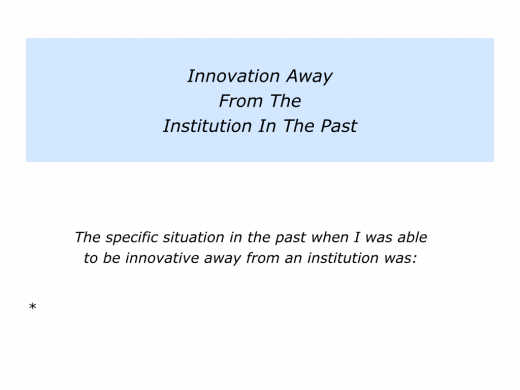 Describe the specific things you did to be innovative away from the institution. “I spent years working inside organisations trying to persuade people to change. But I was battling against the nature of systems theory. “Systems move towards homeostasis – the drive to return to their present state. Sometimes this can be good, because it can create stability. But sometimes it can be dangerous, because it can prevent development. Different people use different approaches to being innovative. One approach is to start by defining the real results to achieve – the desired impact. 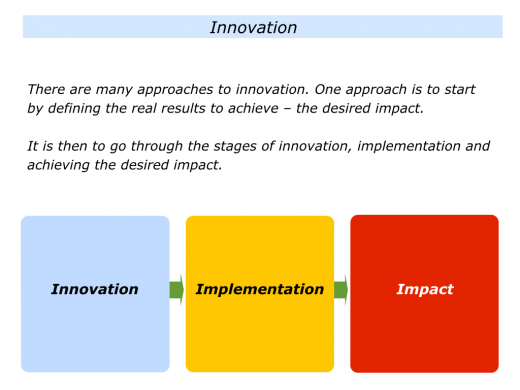 It is then to go through the stages of innovation, implementation and achieving the desired impact. Certainly it is possible, but the organisation must be really serious. Some have championed approaches such as Intrapreneurship, for example, to nurture creative ideas within their organisations. Some creative people have also developed another methodology for revitalising an organisation. This can be equated to building a house. Some people renovate an existing house. 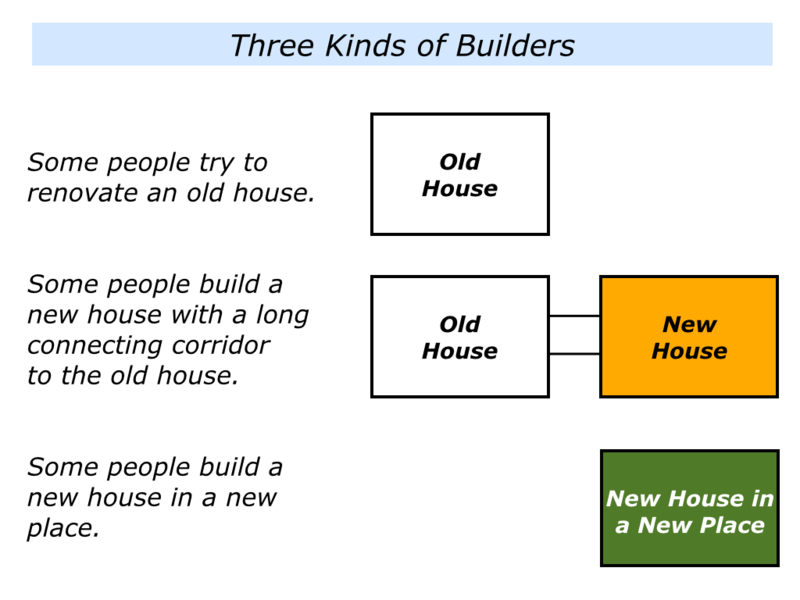 Some build a new house that is connected to an existing house. Some build a new house in a new place. Some combine elements of all three approaches. Revitalising an existing house – or an organisation – can be challenging. Sometimes changing a system meets resistance. Too much time can be spent trying to persuade people, rather than delivering the required results. 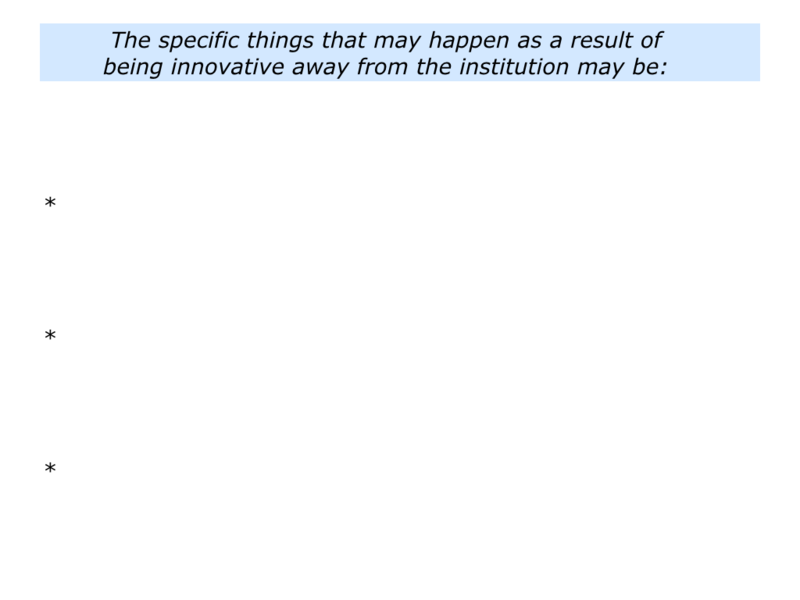 It is possible to revitalise an organisation, but this can be painful. Sometimes it is more effective to take the following approach. Kate is somebody who has followed this route. 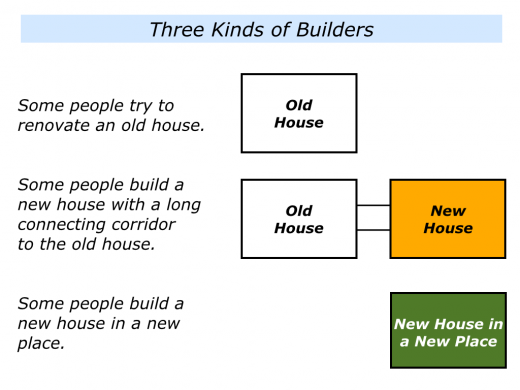 She has built new houses – new ways of doing things – that have been connected to existing organisations. To build the new department, provide great customer service and deliver successful results. To hand over the department to people whom she coached to run it successfully. Pioneers often take this route. They go out and build a house – a new business, new idea or new project – on the prairie. Sometimes they find gold; sometimes they go bankrupt. Different people use different approaches to being innovative. Such people go beyond having a big idea. They move through the stages of innovation and implementation to achieve the desired impact. Innovators need oxygen to breathe. Sometimes it is possible to create the space to do this within an institution. Sometimes it is more effective to create the opportunity to do it alongside or outside an institution. Describe a specific situation in the future when you may want to be innovative away from an institution. 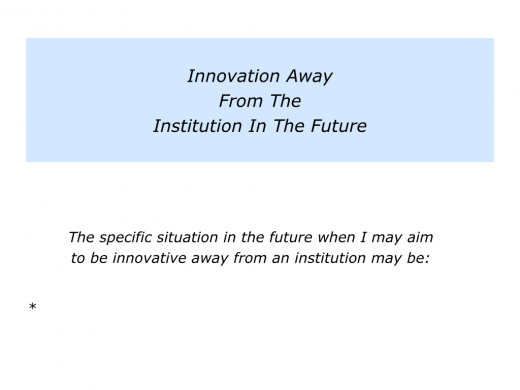 Describe the specific things you can do then to be innovative away from the institution.